When enjoying the backcountry, you can have all the necessary experience and training, the right equipment, and a solid plan, yet things can still go very wrong, very quickly. On a recent training day, Central Okanagan Search and Rescue team members found themselves in just this situation. 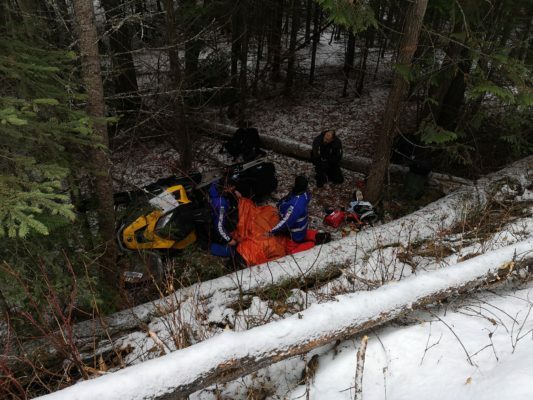 In the middle of December, COSAR members were on a weekend snowmobile training exercise in the Greystokes area near Kelowna. On the second day of training, one of our members had an accident resulting in serious injuries. Central Okanagan Search and Rescue consists of approximately 50 highly trained professional volunteers. The team is on call 24/7 and works in a variety of challenging environments and conditions. COSAR members participate in regular training scenarios that replicate real world conditions and inherently carry some degree of risk. Whenever we go into the field we always thoroughly evaluate the situation and put together a plan that minimizes the level of risk as much as possible. Unfortunately, when in the backcountry, accidents can occur no matter how well you plan and prepare. When the accident occurred, team members were immediately in a position to help the injured member. 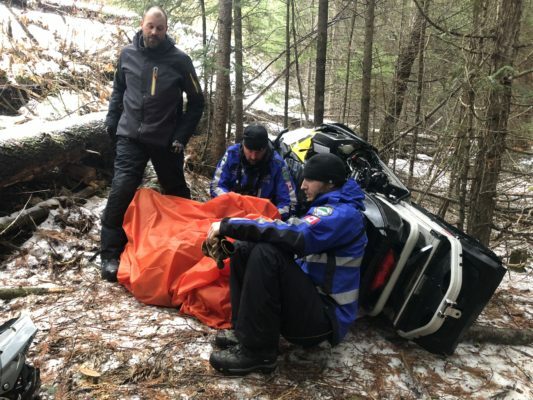 While some members evaluated the subject’s injuries and provided first aid, others packaged the subject to prevent hypothermia while waiting for extraction. A few more members slowed approaching snowmobiles or relayed information to base. Due to the nature of the injuries it was determined that a helicopter was the best method to transport the injured team member to hospital. Cell service was not available to contact 911 and arrange a rescue so the team activated their inReach SOS device. Team members were quickly in touch with GEOS, the monitoring center that handles inReach emergencies, and details of the situation were passed on to Emergency Management BC who activated a response by emergency personal, including COSAR members not on the training exercise and one of our other regional SAR teams, Penticton Search and Rescue. Prior to heading out for training, a detailed training plan covering location, activities, and a list of members involved had been developed and was provided to the SAR Managers that were not involved in the training. This detailed trip plan was created to help responding COSAR SAR Managers plan a suitable response if a situation were to occur. When COSAR received the call from EMBC, this pre-plan become a valuable resource that influenced the decisions that needed to be made by the on-duty SAR Manager. Five hours after the accident occurred, the subject was transported to the hospital. 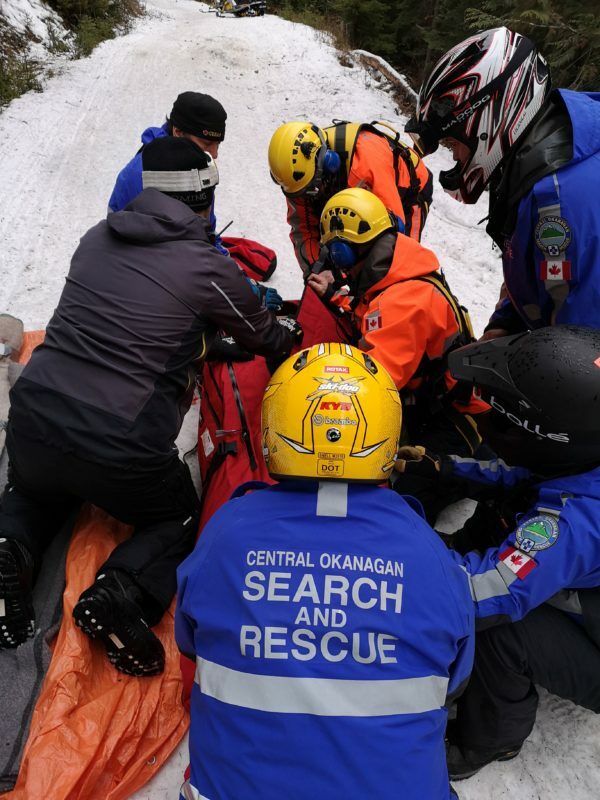 Five hours is not that long for a backcountry rescue but, on top of possible trauma injuries, subjects also face the very realistic possibility of hypothermia. If not dealt with quickly it can become a serious problem in a short period of time, potentially eclipsing the initial injuries. 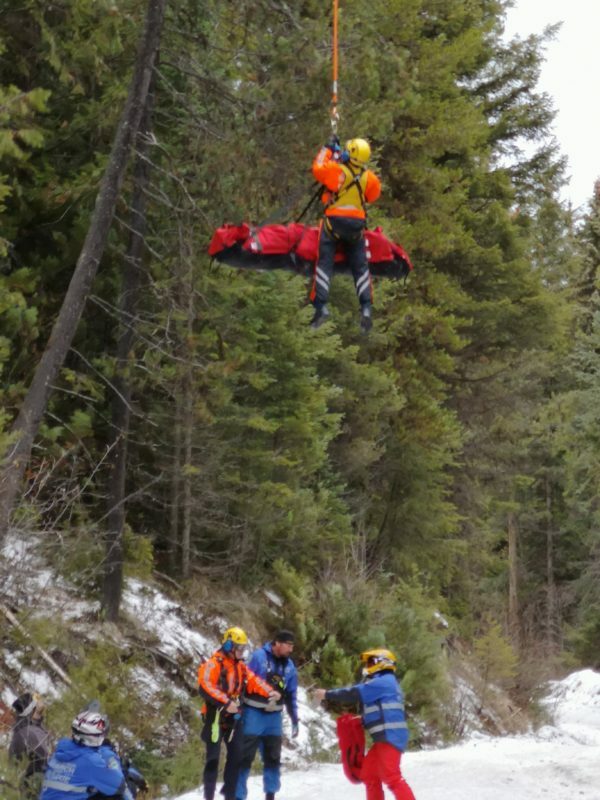 When you play in the backcountry you need to be prepared to be self-sufficient for prolonged periods of time if things go wrong and a rescue is needed. No matter how much training or experience you have, a bit of bad luck is always a possibility and you can suddenly find yourself in a serious situation. The reason you need to take courses such as wilderness first aid, avalanche safety, and navigation is not only to reduce the chance of things going wrong, but to have the knowledge and confidence to deal with a situation if it does. Whenever you head into the backcountry it’s important that you follow AdventureSmart’s Three Ts: 1) Have a solid Trip Plan; 2) Make sure you have the right Training and; 3) Take the essentials. Even though our team ended up in a tough situation, having a trip plan, training, and all of the necessary equipment made the difference between this being an accident with a positive outcome and one with a much more serious ending. 1) If we did not have a good communication device, such as an inReach, it could have added hours on to the response time due to the need to get to a location with cell coverage. Those hours could have been the difference between being able to get a helicopter in before dark or forcing the team to hunker down for the night or figure out a plan for ground extraction. 2) Hypothermia was a very real possibility. If team members did not have what they needed to keep the subject dry and warm, they would have had a much more serious issue to deal with on top of the existing injuries. 3) If team members did not have an appropriate level of first aid, they would have had a tough time addressing the injuries they were presented with. These were not minor injuries that you can handle with confidence after just a basic first aid course. You need to make sure that your level of training matches the type of environments and situations that you might find yourself in based on your chosen type of fun. This accident was not an uncommon one. At this time of year Search and Rescue teams across B.C. are called out multiple times a week to locate and help lost and injured snowmobilers, backcountry skiers, snowboarders, and hikers. The more time that you spend playing in the backcountry, the increased likelihood that you or a partner could find yourself needing help. If help is needed, search and rescue volunteers will drop everything, including Christmas dinner, to come and get you. Until help arrives though, it’s going to be up to you to deal with the situation. So before heading out on your next adventure, make sure that you are well prepared and have covered off the Three Ts.